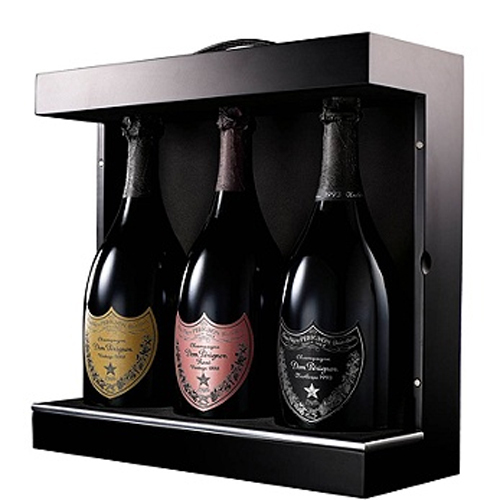 The ultimate Dom Pérignon Vintage Champagne Gift Set. The Power Trio is a set containing 1 bottle of Dom Perignon Vintage 2004, 1 bottle of Dom Perignon Rosé 1998 and 1 bottle of Dom Perignon OEnothèque-P2 1995. Dom Pérignon Vintage 2004: An elegant and seductive wine that shows floral, fruity and toasty aromas with complex notes of mint and liquorice. The bead is impeccable, and it has a balanced line of acidity right through the long finish. Dom Pérignon Rosé Vintage 19983: Perfumed blossom notes rapidly leading to aromas of Orange peel and dried fruits. The wine reveals a fullness of texture couples with a remarkably balanced structure that is both sophisticated and clear out. Dom Pérignon Oenotheque P2 Vintage 1995: This is the second release of this wine and was disgorged in 1995. It has stunning elegance and complexity, with a nose of brioche, citrus rind and perfumed notes, and a palate that has nutty and peppery complexity. It will continue to develop over the next 15 years.